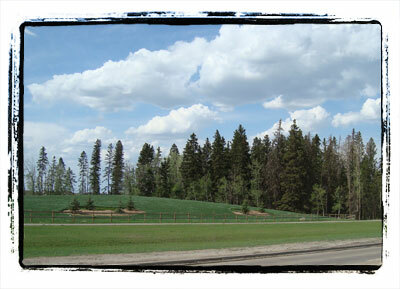 The Virginia Park Woodland is a mixed-wood treestand that offers a diverse mix of tree species including old growth balsam poplar that are approximately 100 years old and 90-100 year old white spruce. The site has a well-developed understory consisting of red-osier dogwood, low-bush cranberry, Saskatoon, honeysuckle, choke cherry, elderberry and gooseberry. There is also an abundance of deadfall and snag habitat for cavity nesting birds and other species. Since there is a relatively continuous open space link from this natural area to the Blackmud Creek ravine located east of the treestand, this area provides stepping-stone habitat for many wildlife species. Many bird and mammal species utilize this area for foraging, shelter and reproductive purposes. 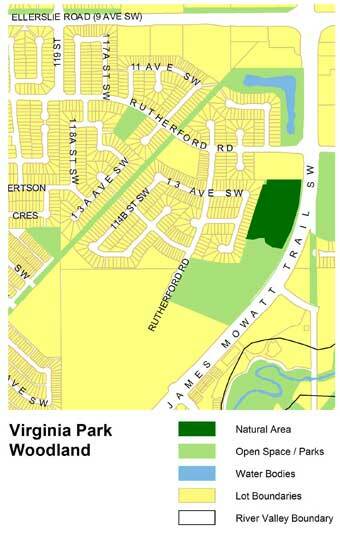 The Virginia Park Woodland natural area is located at 1304 James Mowatt Trail S.W. The main access to this treestand is located off James Mowatt Trail (111 Street) and much of the stand can be viewed from the multi-use paved trail that extends along its eastern perimeter. Several unimproved trails exist that allow access to the interior of the treestand; however, there is no access from the west and north side of this natural area. Parking at this site is currently limited; however, future development of surrounding public park and school space will allow additional parking and access opportunities for this area. This urban treestand provides excellent stepping-stone habitat for a variety of bird and small to medium-sized mammals. The moderate size of this treestand is complemented by an open space corridor that links the natural area, surrounding park spaces and stormwater facility to the Blackmud Creek ravine. The diverse assemblage of tree and shrub species within this natural area offers a variety of habitats that support a relatively wide range of wildlife species.